Sham Shui Po has offered up some really unusual fabric finds when Zoe and I have been out exploring Hong Kong. There is so much different fabric here to choose from. I love natural fibres and prefer to be sewing with 100% cottons and linens. When I found these two fabrics though, I had to embrace the polyester. I think they will be perfect Christmas presents for some special little girls in my life, who love pink and sparkly things. This bunting has taken me over two months to complete. The pink fabric is quite awful to cut accurately, it frays easily and the little bits stick to everything. I mean everything. I have not really enjoyed working with this fabric. I wanted the comfort zone of my usual 100% cotton fabric. Along the way, I also found these two fabrics (more polyesters). I had intended to include them, but I think they don't fit with the pink and sparkly bunting. They make gorgeous buntings on their own (and possibly together, now I see them side by side above) just not with the pink and sparkly bunting. What do you think? Have a lovely Creative Space day. Oh my goodness, such happiness!!! The sparkly and pink bunting gorgeous, your hard work has certainly paid off! Good choice to omit the last 2 fabrics from the bunting above but I do think they are lovely and would go well together for a separate bunting! 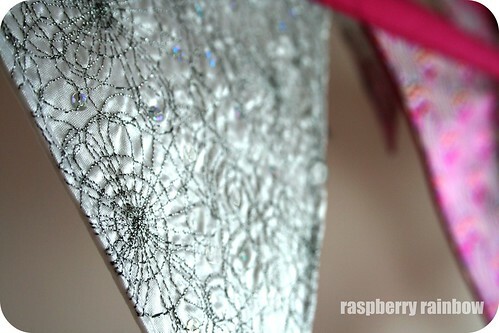 What little girl wouldn't love the sparkly bunting you have made. The second set of fabrics will make another great set of bunting. I'm with you: give me cotton fabric to sew with. Over the years I've made lots of dance costumes from sparkly, shiny fabrics. They were always a challenge. So pretty!! This is the kind of fabric that you just want to touch. I especially love the pink flowers. 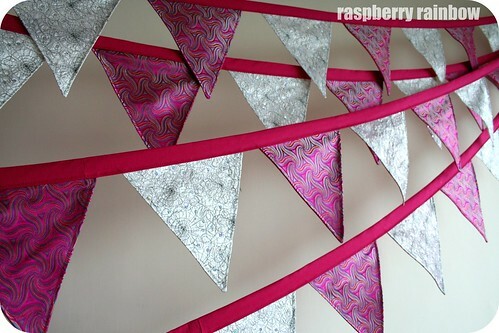 I do love a bit of sparkley arkley, the bunting is deliciously so! The two at the end do look good together and I think would look good with the silver as well. I am glad you're incorporating some of those exotic fabrics even if they're difficult they look superb. 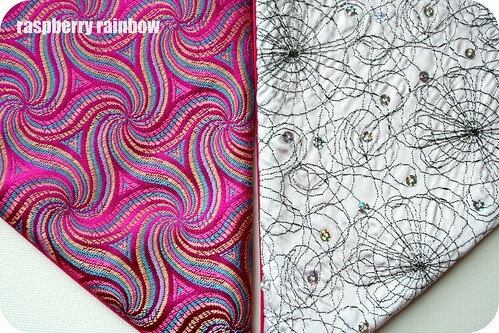 I also think the bottom two fabrics are stunning and they do look great together. i want to reach out and grab those last two buntings! These are really beautiful Cat - I love the colour and textured patterns! 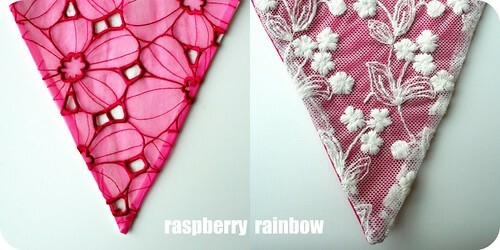 Gorgeous bunting - especially love that swirly pink one. And you definitely made the right call by using just the two fabrics. The last two will make a lovely bunting on their own, I think. Oh I am so glad to have "met" you via instagram! Your blog is gorgeous and I can probably comment on every post! This is my favourite so far - your bunting is so beautiful and I love THOSE colors! Entirely envious of your crafty skills :) And enjoying seeing HK through your eyes!